AMONG THE HILLS and gardens of rural Wicklow is a unique park, built for quiet contemplation. It’s populated, however, by a number of sculptures, which might have a less than calming effect. 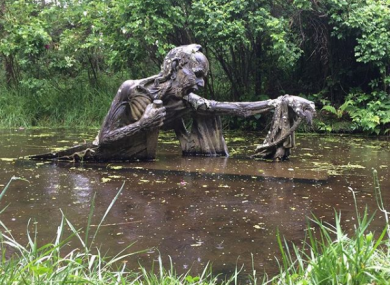 Presiding over an algae-covered pond, The Ferryman’s End is just one of 44 unusual statues to be discovered in Victor’s Way - a privately-owned garden spanning 20 acres, situated in Roundwood. Who is responsible for Wicklow’s garden of meditation and what do these striking figures symbolise? Opened in 1989 by German-born Victor Langheld, Victor’s Way is described, on its website, as a “contemplation space for lone adults between approximately [the] ages of twenty-eight and sixty-five.” It took Langheld more than 25 years to complete the design of the garden. Langheld has a long-standing interest in the spiritual, according to Stair na hEireann, which notes that he spent much of his adult life travelling to religious sites in Asia, before arriving in Ireland. Also known as the Indian Sculpture Park, the statues are designed in Wicklow before they are meticulously crafted from black granite by a number of sculptors based in Mahabalipuram, in South India. The Sculpture.org database notes that the seven larger pieces portray the “stages of the human’s journey from self-discovery to self-realization to self-denial”. In the case of The Ferryman’s End, the frail skeletal figure is depicted in an anguished state, struggling to keep his head and upper torso above the algae stained water. This ferryman’s craft (ie his skill) lies dead in the water. In simple Irish terms, this ferryman has ‘lost the plot’ and feels awful… Unmoving, that is to say, adrift in sameness, he sinks and dies together with his passengers. For those in need of an afternoon of self-reflection, make a trip to Victor’s Way in Wicklow before it closes for business until 2019. The final day to visit the frightening The Ferryman’s End statue and his fellow figures inspiring personal growth is Sunday September 30. Email “Double Take: The eerie swamp statue found in a little-known Wicklow park ”. Feedback on “Double Take: The eerie swamp statue found in a little-known Wicklow park ”.